Assault climbers in the United States Marine Corps operate in cold, extreme cold, mountainous and icy environments using various equipment ensembles. Our clients asked us to assess the suitability of the current Mountain Assault Climbers Kit (MACK) items and possible future items to ensure that assault climbers have the best possible equipment. Twelve assault climbers as well as professional mountaineering and alpine guides completed a series of tasks while testing and evaluating different equipment items and ensembles. 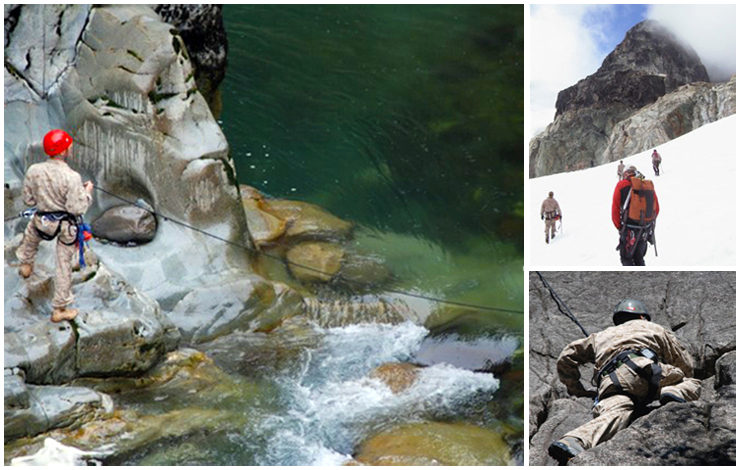 Tasks included snow and ice activities on a glacier, steep earth activities, and river crossings. Focus group sessions, observations, participant comments throughout the trial, and review of existing standards, were also used to assess the current MACK kit. This effort allowed our client to compare for themselves what kit would work best in real-life conditions. We provided future requirements related to functional, design, usability, and maintainability of equipment. Providing people with the best tools available is an important way to keep them safe and to help them be effective. Knowing how equipment stands up under heavy use can also reduce long-term costs. We are experts in systematic evaluation, providing strong advice about what works best for people wherever they work.